The 2013 Formula 1 season draws to close this weekend, with the final race being held at Interlagos, Brazil. The World title was decided an age ago it seems, with Sebastian Vettel clinching a fourth world title in a row. Vettel has also won eight races in a row, to hold the record for the most consecutive wins in a season. One record remains though. This record has stood for over 60 years and is currently held by an Italian driver, Alberto Ascari. Ascari is one of only two Italian World Champions in the history of the sport (the other was Giuseppe Farina in 1950), and the only one to win his two championships in a Ferrari. Ascari won nine consecutive races across two seasons during 1952 and 1953 securing two World Championships in the process. He won his first drivers' championship for Ferrari in 1952, after making his debut in 1950. He won the remaining six rounds of the season to clinch his first title and recorded the fastest lap in each race. Three more consecutive race wins at the start of the 1953 season gave him nine straight championship wins before this run was ended when he finished fourth in France. Two more wins later in the year clinched a second consecutive World Championship. A switch to Lancia in 1954, after leaving Ferrari due to a pay dispute, was not a success. Numerous problems with the car meant it was not ready for racing until the end of the season. But when the Lancia D50 was ready, Ascari showed it's potential by taking pole position in the Spanish Grand Prix and leading the race until clutch failure saw him retire from the race. At the start of the 1955 season excitement was building as the battle between Ascari in the Lancia D50 and Juan Manuel Fangio, widely regarded as one of the best drivers in the history of Motor Racing, in a Mercedes looked set to dominant the sport. A positive start to the season came to a halt in the Monaco GP, as Ascari crashed into the harbour, escaping with a broken nose. Four days later, on 26 May, he went to Monza to watch his friend Eugenio Castellotti test a Ferrari 750 Monza sports car. Ascari, being the fiercely competitive person he was, decided to test the car out over a few laps. 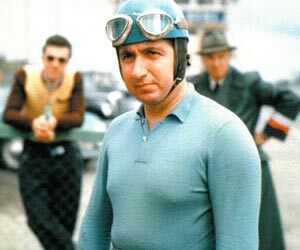 Ascari was very superstitious, he always insisted on using his distinctive pale blue crash helmet. On this occasion his usual helmet was being repaired after the accident at Monaco and he stepped into the car wearing shirt sleeves, ordinary trousers and Castellotti's white helmet. On the third lap the car suddenly skidded, turned on its nose and somersaulted twice. Ascari was thrown from the car and suffered multiple injuries and died a few minutes later. The crash occurred on the Curva del Vialone, one of the circuits high-speed corners. The corner has been renamed in his honour. It is now know as Variante Ascari. Ascari was laid to rest next to the grave of his father in Milan. This tragedy is compounded by some eerie similarities between the deaths of Ascari and his father. Ascari died on 26 May 1955, aged 36. His father was also 36 when he died on 26 July 1925. Both were killed four days after surviving serious crashes, both on the 26th of the month. The final similarity is they both crashed at the exit of left hand corners and both left behind a wife and two children. Italian fans nicknamed Ascari 'Ciccio' (chubby). Enzo Ferrari described Alberto Ascari as being 'virtually impossible to overtake' when leading. He added "Ascari had a precise and distinctive driving style". This was a man who, for a period, dominated grand prix racing. Parallels in this respect with Vettel are easy to make. Like Schumacher before him, Vettel is consistantly performing to a high level, and the rest of the field are left in his wake. Ascari established records for the highest percentage of wins in a season and for the most consecutive wins from races started, both of which remain unbroken almost sixty years later. From a career cut short by his death in 1955, and which covered only a total of about three seasons in five years, he started 32 races and won 13 of them - a win ratio of more than 40%. That is second only to Juan Manuel Fangio. Championship rival, Mike Hawthorn, was quoted as describing the Italian's talent by saying: "Ascari was the fastest driver I ever saw. And when I say that, I include Fangio." "I have lost my greatest opponent," Fangio said after Ascari's death in 1955. "Ascari was a driver of supreme skill and I felt my title last year lost some of its value because he was not there to fight me for it. A great man." Ascari will forever remembered as one of the greatest racers of all time.